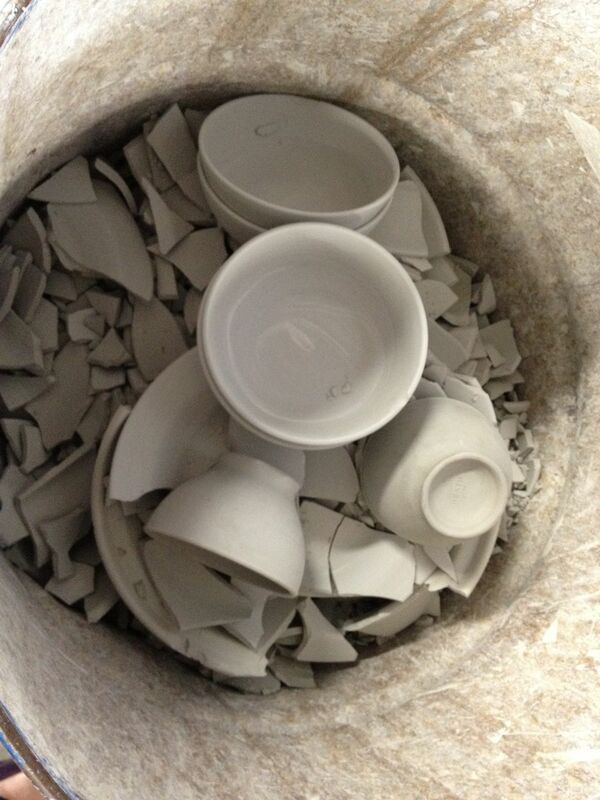 On Friday, my mom and I visited the Heath Ceramics factory and shop. A few months ago, Jordan and I took the tour of the factory and it was fascinating. I blogged about when I first fell in love with Heath Ceramics here. I thought my mom would enjoy the tour and so we went back. I decided to take more pictures this time. For those of you who missed my first post, this is a bit about Heath Ceramics—Heath Ceramics was founded in 1948 in Sausalito, CA by Edith Heath. She was a feisty lady who knew her mind. She built her ceramic factory on the values of quality and sustainability, using local materials as much as possible and paying the real cost of labor always. Basically, she wanted to make simple, good things for good people. And so she did for the next 50 years. In 2003, husband and wife team, Robin Petravic and Catherine Bailey purchased Heath Ceramics with a mission to revitalize the company, which was in a bit of a tough spot. By placing a strong emphasis on design, handcrafted techniques, and the reinvigoration of the company’s designer-maker legacy, Robin and Catherine have persevered. Today, Heath Ceramics is one of the few remaining American potteries still in existence and Edith’s values are still going strong. Every piece they sell is made in their Sausalito factory by a team of 60 craftsmen, and every piece is truly a work of art. Slip casting. Vases, mugs, teapots and other complex shapes are made this way. Plaster molds and a lathe are used to create most of the dinnerware. Each piece is then hand trimmed and sponged smooth. Every piece dries in a 120 degree room for 24 – 48 hours to remove all the moisture from the clay so it doesn’t explode in the kiln. Then the pieces are glazed. Aren’t the names of the glazes something! They make them all from scratch at Heath. The pieces are then fired in a kiln for several hours. These are their holiday colors. So festive! Tiles made by Edith after a visit to the Southwest. The teapot is the most complex design they make at Heath. The adorable designs on these dinner plates are hand etched. And, I’ve got to say, coffee out of one of these mugs just tastes better. If you’re interested in visiting Heath Ceramics, or just picking up a few wonderful handcrafted gifts for the upcoming holiday, visit their site for more information. Preheat an oven to 350 degrees. Cut the squash in half and scoop out the seeds. Brush with olive oil and sprinkle with salt. Bake for 45 minutes, until fork tender. While the squash is baking, cook the barley. Boil 3 parts water with 1 part barley with a little dollop of butter. Once boiling, turn the heat down and cover. Simmer for 25 minutes, until the barley is tender. While the barley is cooking, take the sausage out of its casing. Saute the sausage until just cooked through, about 5 minutes. Transfer to a large bowl. In the same pan, sauté the onion in a the rendered chorizo fat. When the onion is translucent, add the garlic. Saute for a few minutes more and transfer to bowl with the chorizo. Add a little butter to the pan and sauté the mushrooms. Season with salt and pepper. Once browned, add to the chorizo and onion mixture. When the barley is finished cooking, add it to the onion, chorizo and mushroom mixture. Stir to combine and season again with salt and pepper. You want the filling to be flavorful on its own. Once the squash is tender, remove from the oven and stuff with the barley mixture. Top with cheese — we used swiss, but Monterey jack, Gruyère or parmesan would all do— and put back in the oven for 10 more minutes to melt the cheese. This dish is very hearty and autumnal. We enjoyed it with a simple salad on the side. It is still fall, and so I continue to cook things with squashes. Plus, I had pumpkin puree left over from the pumpkin tea cake I made last week. This pumpkin ice cream was tasty! The second day after freezing, it had a bit of a grainy texture. I’m not really sure why that happened, but there is really only one way to get to the bottom of it. More testing/tasting! In a large bowl, make an ice bath. In a saucepan over medium heat, heat the milk and cream until hot. In another bowl, whisk together sugar, ginger, cinnamon, nutmeg, salt and eggs yolks. Slowly pour the hot milk mixture into the egg mixture, whisking well. Pour this custard back into the saucepan. Stirring constantly, heat over medium until the custard has thickened. Pour this custard through a sieve into a medium metal or glass bowl. Whisk in the brown sugar. Set in the ice water bath. Let the custard cool, stirring occasionally. Once cooled, stir in the vanilla and pumpkin. Pass the mixture back through the sieve. Pour into your ice cream maker and freeze according to the machine’s instructions. Freeze the ice cream for several hours in the freezer if you’re able. But, there is no harm in enjoying it straight out of the ice cream maker either. It’s fall, which also makes it time to bust out pumpkin-everything. First up to the plate … pumpkin bread. The sugar crust on this bread is lovely, the spices are perfectly balanced and it has a moist, delicate crumb. Basically it is everything you want from a quick bread. Preheat your oven to 325 degrees. Butter a loaf pan. Sift together the flour, baking powder, soda and spices into the bowl of your stand mixer or a large bowl. In another bowl, whisk together pumpkin, oil, sugar, and salt. Add eggs, one at a time, mixing well after each addition. On low speed, mix the wet ingredients into the dry. Mix until just combined. You don’t want to over mix because it will make a tough bread. Sprinkle with the sugar topping and bake for about an hour. Let cool in the pan for 20 minutes and then invert onto a rack to cool completely. A few weekends ago, I was reading cookbooks and drinking coffee while Jordan slept in and Willow took up too much space in the bed. (It’s hard to kick something this cute out from under your covers, trust us). I stumbled across a variation on Pasta Amatriciana—pasta with braised bacon and roasted tomato sauce—in the Zuni Cafe Cookbook. When Jordan woke up, I shared just the recipe title and he was sold. I set out to make this magical pasta. The recipe calls for slab bacon, which you then braise with a variety of vegetables and spices. Well, slab bacon is really hard to find, even at a fine market like Whole Foods. In a stroke of genius, I tied the cut bacon together so it re-formed a slab. Sadly, this does not work. My braised bacon was so bland; all of the smokey, salty flavor had leached into the broth and left the bacon beyond dull. There are few things sadder than flavorless bacon. Fortunately, Jordan saved the dish by bringing home the back-up bacon. We sautéed that bacon and added it into the roasted tomato sauce, plus some of the braised bacon for texture. It worked well, but was slightly disappointing. The time-energy input did not match the deliciousness output. The second time I made this recipe, I skipped right to adding sautéed bacon to the roasted tomato sauce. It is so good and so easy. The last time I made this recipe, we had no bacon at all. We did however have some rendered bacon fat in our fridge. I sautéed the onions for the sauce in that bacon fat, and like magic, delicious bacon flavor infused the whole sauce. It was unexpected and amazing and so inexpensive. The next time you cook bacon, pour the fat into a small bowl. Fill with the bowl some water to separate the fat from the burnt bits. Refrigerate this mixture until the fat forms a solid mass on top of the water and carefully scoop the fat off the top. Sauté away, adding delicious bacon essence to whatever you cook! 1 lb pasta (we used ziti and penne). *A is a beautiful photo of a technique that I don’t recommend you subject your bacon to. Heat an oven to 475 degrees. Strain the tomatoes of their juice and reserve that juice. In an oven safe dish, add the strained tomatoes and a drizzle of olive oil. Roast the tomatoes for 20 – 30 minutes, until browned. In a saute pan, saute the bacon until just cooked through. Remove from the pan and set aside. Pour off the excess fat, leaving a tablespoon or two. Sauté the onion in the bacon fat until translucent. Add the garlic and sauté two minutes more. Add the roasted tomatoes and reserved juice. Add sugar, salt, pepper and a pinch of chili flakes. Cook for 20 minutes and test for seasoning. Meanwhile, put a pot of salted water to boil. Cook the pasta until al dente. When the pasta is nearly done, add the bacon back into the sauce. Toss the sauce with the cooked pasta and serve with a sprinkle of parmesan. I am a big fan of the Spilled Milk Podcast by Molly Wizenberg and Mathew Amester-Burton. It makes me laugh out loud—usually on my commute home—which in any other city might look weird, but in San Francisco just makes me typical. A few weeks ago they did an episode on Thai Salads and I was inspired to try this dish. The toasted rice component was irresistible. This dish is typically served in cabbage leaves. You could also serve it over rice or noodles. Or —my preferred method—make little Thai burritos with cabbage leaves, rice and larb all wrapped up in one awesome bundle. Heat a skillet over medium-high heat. Add the ground chicken or pork, shallots, scallions, red pepper flakes, fish sauce, and lime juice. Cook, stirring occasionally, until the meat is cooked through. Turn the larb out into a bowl and cool for at least ten minutes. Stir in rice powder. Serve with cabbage or lettuce leaves for wrapping. Place a dry skillet over medium heat. Add 1/4 cup white rice to the pan. Toast the rice, stirring and shaking the pan frequently, until the rice is golden-brown, about 5 minutes. Cool to room temperature and grind to a very fine powder in a spice grinder or coffee grinder. I used my magic bullet—thanks Dad! Larb is as delicious as it is fun to say! Jordan and I really enjoyed this meal. We are also trying to invent more things to top with toasted rice powder! That stuff is awesome. Inspired by a delicious dinner at our friend Ted’s, I decided to try my hand at Indian. For a first attempt it was successful, but could still use some tweaking. The dal was good, but a little over-spiced for my tastes. I’ve adjusted the recipe below to how I plan to make them next time. And, because I like to take an easy meal that would normally be ready at 7 pm and turn it into an epic culinary adventure that we sit down to at 10:30, I decided to make naan from scratch. It was totally worth it though. This naan is really good, especially considering our clear lack of tandor oven. Drain the peas and place in a dutch oven. Add 6 cups of water and the tomato. Bring to a boil. Reduce the heat and simmer for 45 minutes, until the peas are tender. Pick out the tomato skins and whisk the dal break up some of the peas. Reduce the heat to low and keep warm. Heat the oil over medium heat. Once the oil is hot add the cumin seeds. Saute the seeds until golden, 1 – 2 minutes. Add the onion and saute for a few minutes. Add the garlic, turmeric and cayenne. Pour this mixture into the pea soup. Stir to combine and and season with salt. Add the cilantro leaves and butter just before serving. In a large bowl or the bowl of your stand mixer, dissolve yeast in warm water. Let stand about 10 minutes, until frothy. Stir in sugar, milk, egg, salt, and enough flour to make a soft dough. Knead for 6 to 8 minutes. Cover with a towel and let rise for 1 hour. Pinch off small handfuls of dough about the size of a golf ball. Roll into balls, and place on a baking sheet. Cover with a towel, and allow to rise until doubled in size, about 30 minutes. Heat a grill—we used a cast iron pan— over medium high heat. Lightly oil the grill or pan. Roll one ball of dough out into a thin circle. Place dough on grill, and cook for 2 to 3 minutes, or until puffy and lightly browned. Brush uncooked side with melted butter, and turn over. Brush cooked side with butter, and cook until browned, another 2 to 4 minutes. Remove from grill, and continue with the rest of the balls of dough. While I’m sure the following statement won’t surprise you in the least, it is all about the butter with this naan. Don’t skip that step. It makes the bread heavenly. Jordan made these sandwiches for breakfast on Saturday. Leftover brioche bun + black forest ham + swiss cheese + farm fresh fried egg = awesome. They are easy. Toast some bread under your broiler. Add a slice of ham (or turkey or bacon or whatever else you have around) and a slice of cheese. Broil that. While your melting the cheese, fry a quick egg. Top the whole thing with some parsley and pepper. Ta-da! Why brave brunch lines when I can eat this awesome sandwich in my pajamas with wacky hair and my pup at my feet? I’ve been talking about making French onion soup for a while now and the stars aligned on Monday after my weekend stock-making adventure. What better way to showcase my labor of love than in a ultra-simple dish like onion soup. Again I turned to Julia for the recipe. In a heavy stock pot or dutch oven, cook the onions slowly in butter and oil covered for 15 minutes. Uncover, raise heat to medium and stir in the salt and sugar. Cook onions for 30 – 40 minutes, stirring often, until golden brown. Sprinkle in flour and cook for 3 more minutes. Take of the heat and stir in the broth. Add the wine and simmer for 40 minutes more. Season with salt and pepper. Just before serving, toast bread on both sides. Sprinkle cheese onto the top of the crouton and broil until melted and bubbly. Ladle soup into bowls and top with cheesy crouton (or two or three). The cheesy crouton and soup combo is amazing.